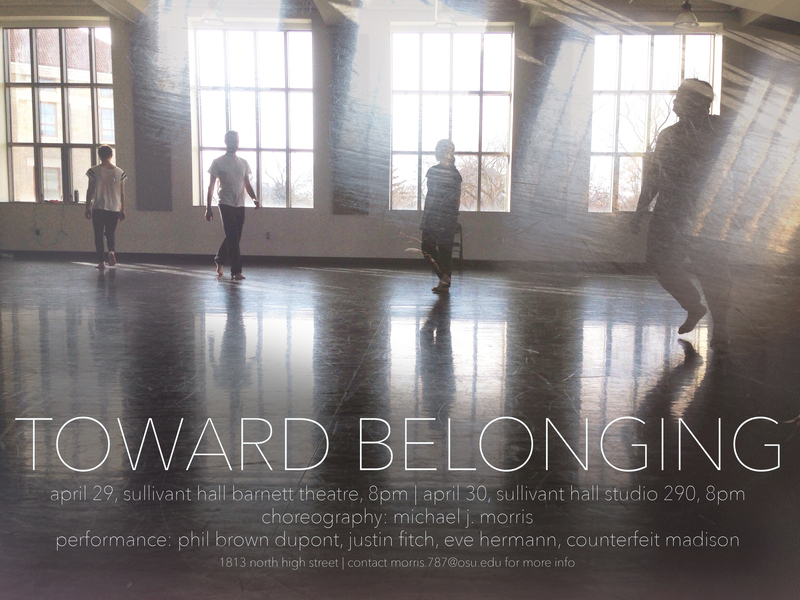 On April 29 and 30, I will be premiering a new dance work entitled TOWARD BELONGING, featuring performers Phil Brown Dupont, Justin Fitch, Eve Hermann, and Counterfeit Madison. We have been developing this week since the beginning of January, and now we are mere weeks away from sharing our work with you. 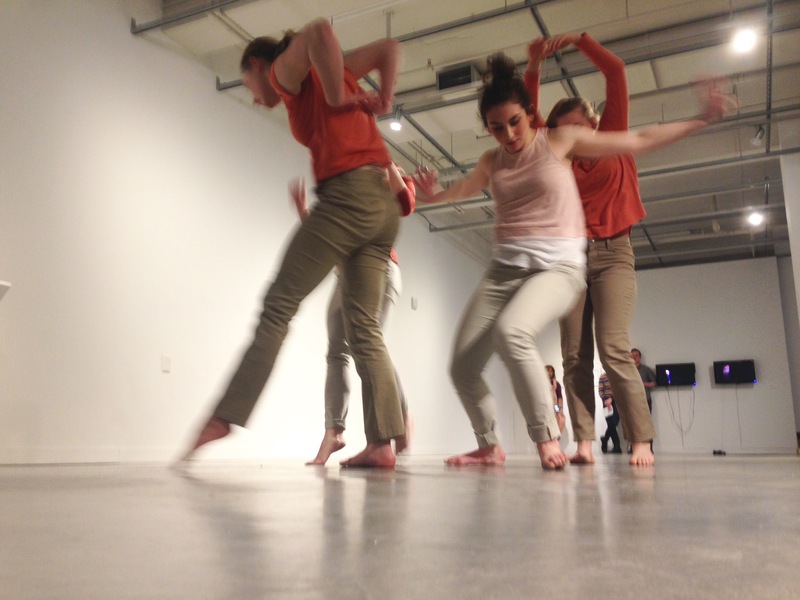 This new dance moves through the mechanics and formal dimensions of sociality, the physical vocabularies of how bodies are together. It examines how bodies follow one another along paths that are straight or along trajectories that veer queerly, how they fall in line and out of step, how they carry one another along and are moved by what other people do, how they gather and separate. 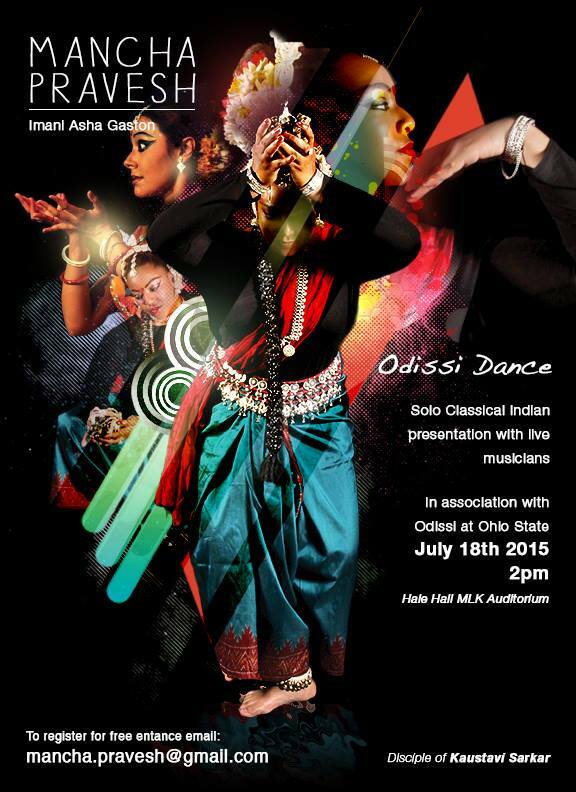 Sullivant Hall is located on the OSU campus at 1813 North High Street in Columbus, Ohio. Please enter from the front (east) entrance facing N. High Street. Other entrances to the building may be locked after hours. The Barnett Theatre is on the third floor, just off the rotunda. Studio 290 is on the second floor, in the north-west corner of the building. Follow the second floor north corridor. Sullivant Hall has an elevator to the second and third floors, located just off the rotunda. The seating in Barnett Theatre is folding chairs on risers, with floor space for additional adjustable seating. 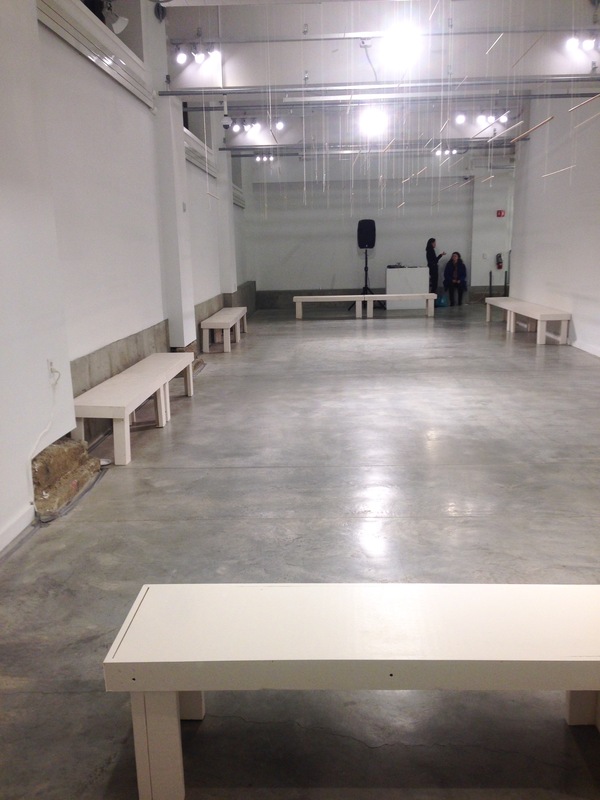 The seating in Studio 290 is folding chairs and floor seating. Please contact me at morris(dot)787(at)buckeyemail(dot)osu(dot)edu if you have any questions about access or have particular access needs. There are many reasons that I love living in Columbus. Tonight I was reminded of one of the most prominent reasons: people here make things happen, and other people show up. 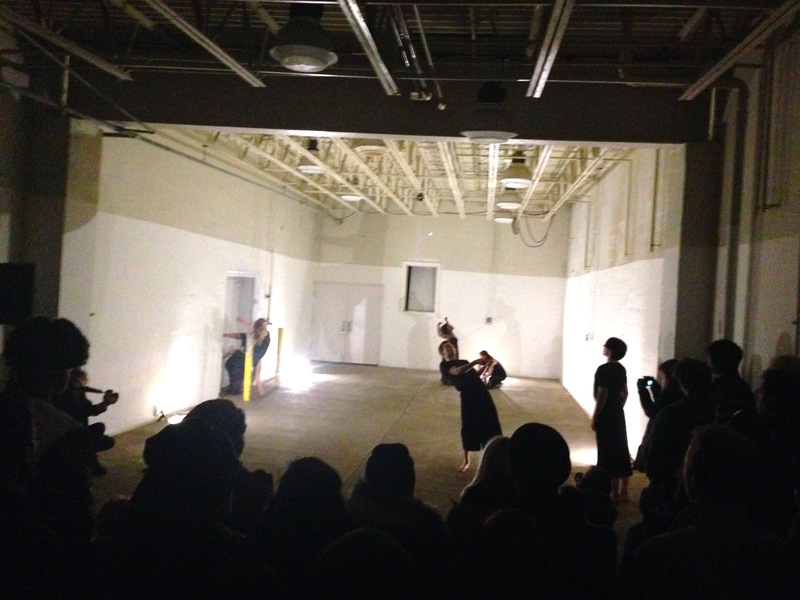 I had the opportunity to see the opening night of Partially Nothing + Wholly Something, a new dance work by Kat Sauma | Assembled Hearts, presented at MINT Art Gallery. 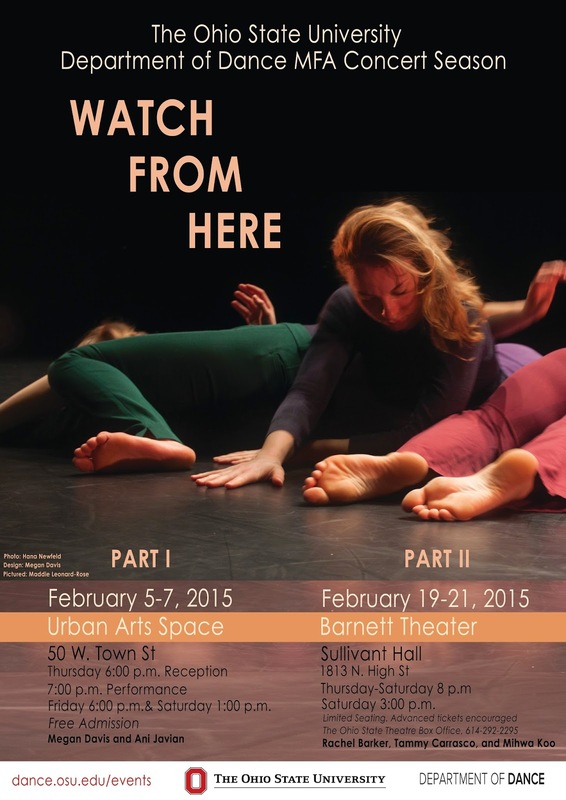 The project was choreographed and directed by Kat Sauma, a recent graduate of the Ohio State University Department of Dance. 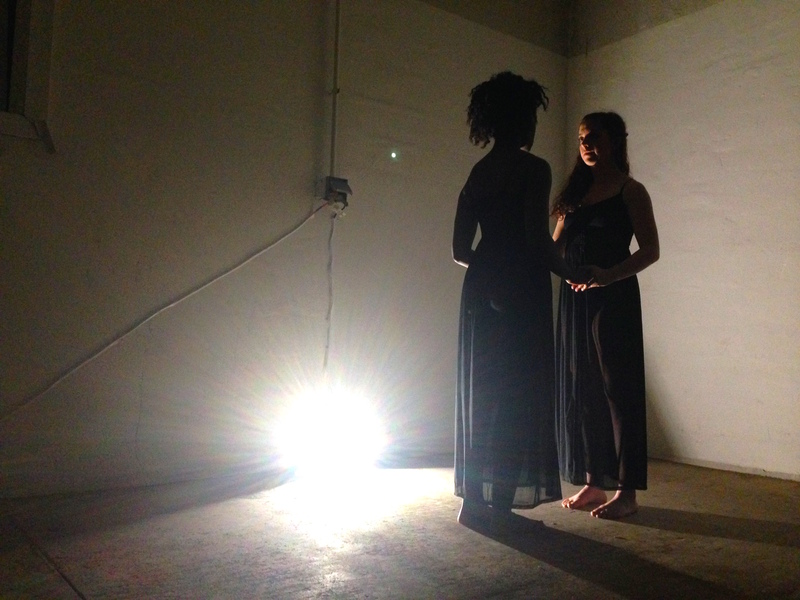 Sauma’s project moves into an important, necessary role for our city: the production of dance by independent dance artists. 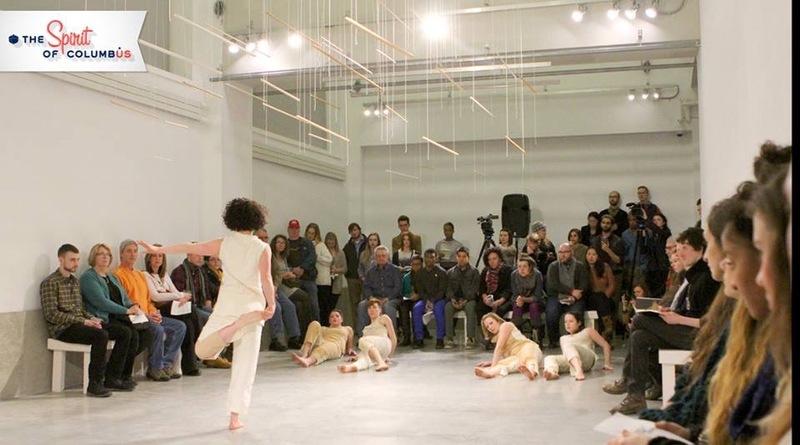 I believe that this is the first dance performance that MINT, a relatively new space in the Columbus scene, has hosted, and I am delighted to see Sauma partnering with this art collective. 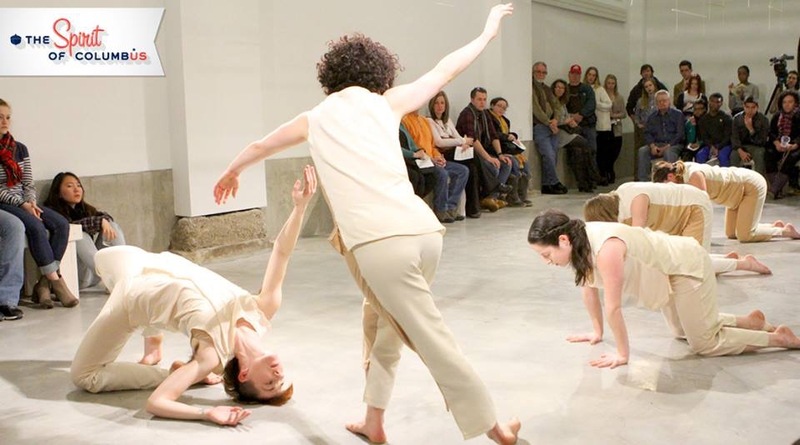 The evening of dances unfolds through multiple spaces inside the MINT warehouse; there are always multiple choreographies, enmeshed and pushing into the next. 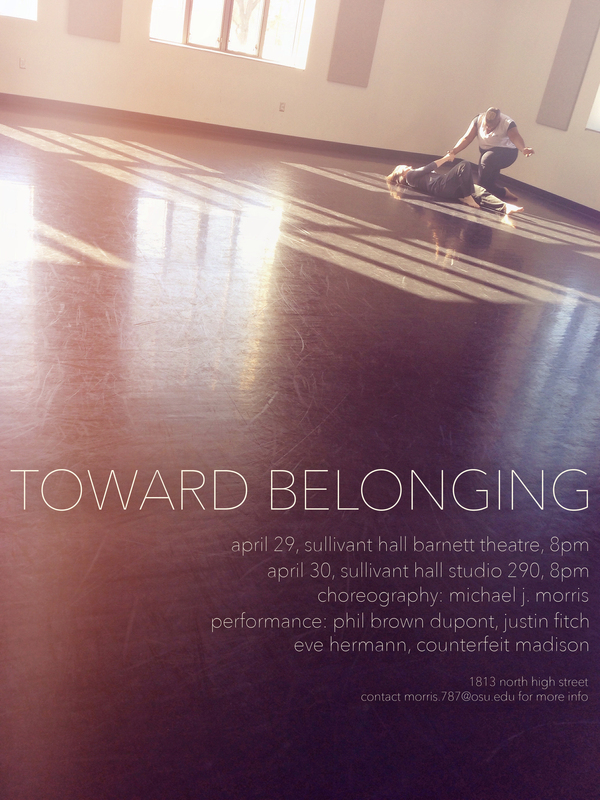 In addition to mobilizing dancers through a series of small vignettes—duets and trios and solos alongside other small groupings—the piece moves the audience through multiple rooms and facings and configurations. 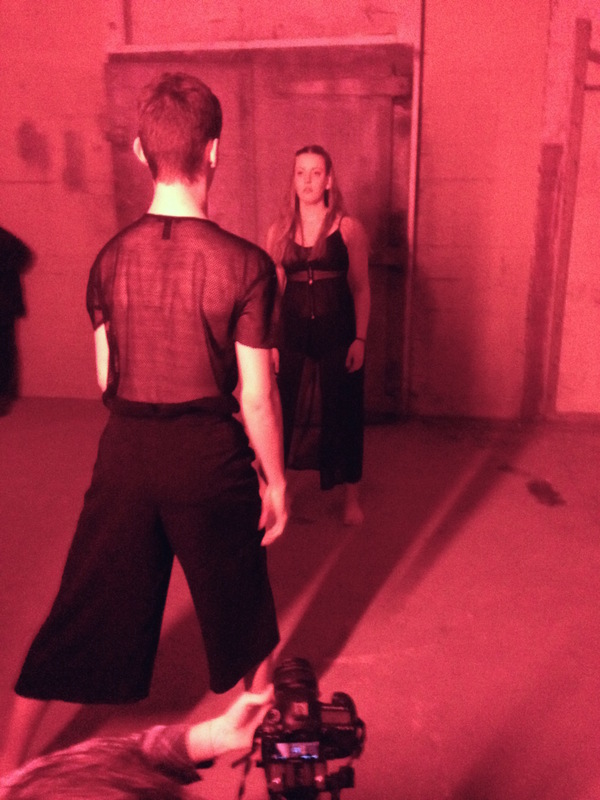 We are quite literally moved by the dancers, sometimes given verbal directions—”You can go to the center of the room; you can line up against the wall”—and sometimes following tentatively as dancers weave through darkened doorways and down dimly lit hallways. The dance is certainly comprised of moving bodies, but it is also heavily inflected by innovative uses of simple, lo-fi lighting—courtesy of Ethan Schaefer. 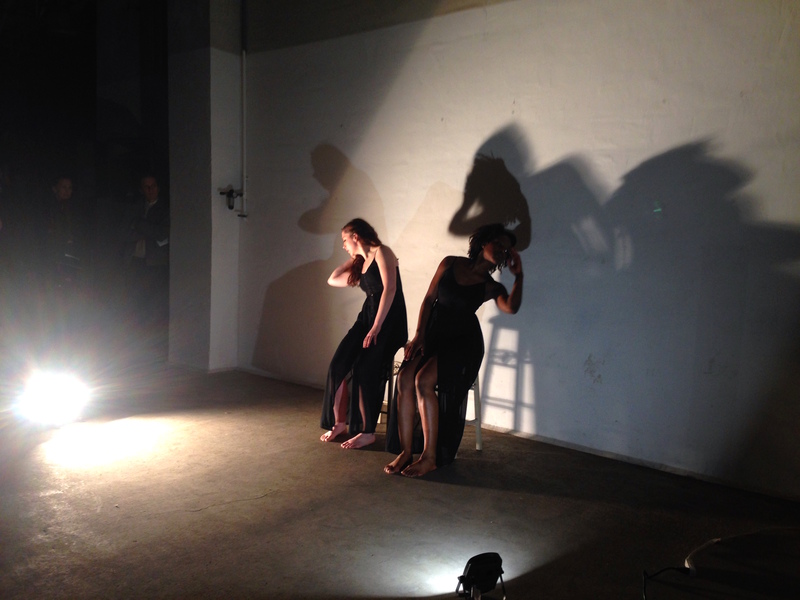 Most rooms are dark, but the minimal lighting with bright flood lights on the floor or colored fluorescent bulbs along columns and walls fills the spaces with atmosphere and a flurry of shadows cast above and around the performers and the audience. 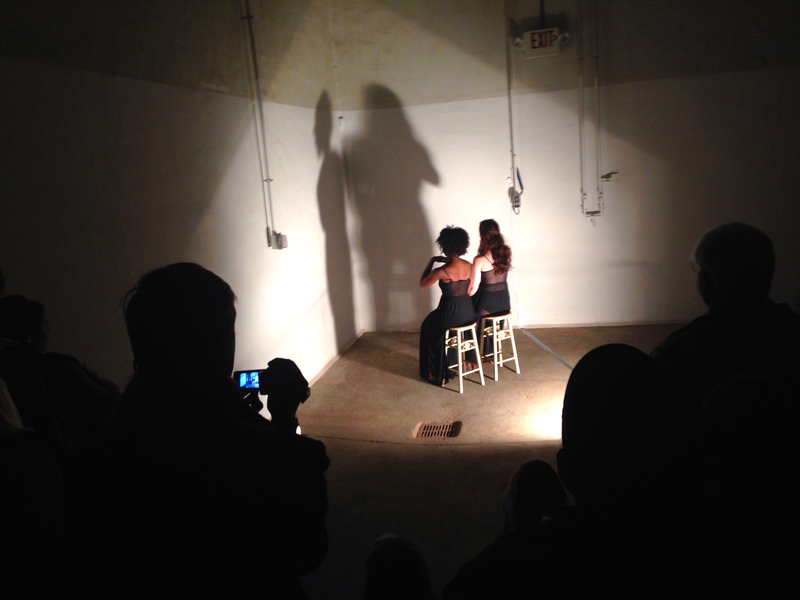 As the performance begins, the overhead lights are cut off, and the crowd gathers facing two stools lit in the corner of the space. Two dancers—Anna House and Tyisha Nedd—make their way through the crowd and sit down facing the corner. They dance a duet of reaching arms, twisting torsos, and turning heads before standing, picking up the stools, and moving to another wall. They sit down again, this time facing us. More reaching and twisting, elbows pulling their shoulders and faces away and towards one another. These seated duets are tender and intimate; at moments, their fingertips brush against each other, and at other moments, their faces are so close they are almost kissing. They stand again, relocate to a third wall, and dance in unison, mirroring each others’ movement. Now standing barefoot on the cold concrete floor, facing each other, turning away in complimentary opposition, their unison offers sameness while their skin—House’s light and Nedd’s dark—and hair reminds me that there are differences even when they move as if the same. These three brief vignettes escalate in openness—first seated and facing away from the audience, then seated and facing us, then finally standing and facing each other—and as we move into the second room, I feel that we are moving into something somehow already more vulnerable. The second room is lit with bright pink fluorescent bulbs. 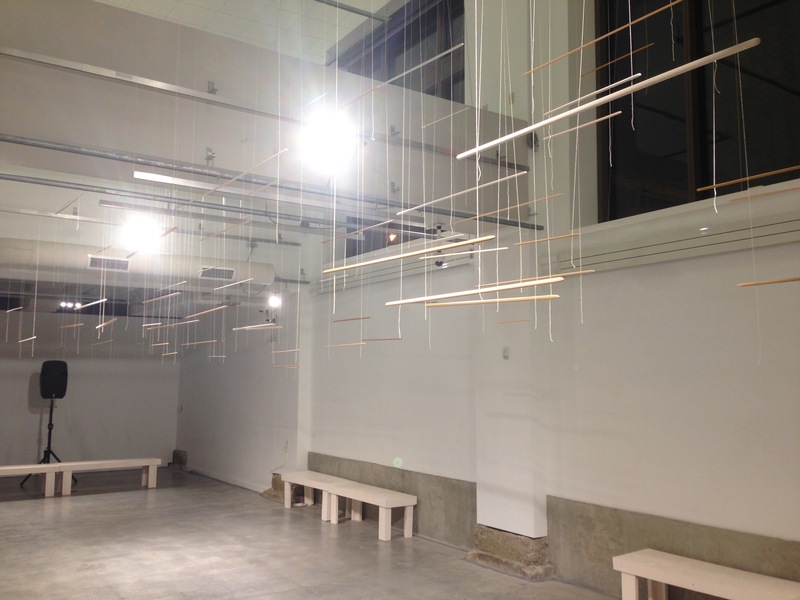 The audience is directed to gather around a column in the center of the room and along the outer walls. We create two rings of viewers facing each other, and between us, two dancers—Tim Bendernagel and Claire Moore—circle the room, walking in opposite directions. Already their is a simple complexity to this arrangement, four circles—the two rings of viewers and the two dancers’ pathways—overlaid into each other, and somewhere between or across these circles is the dance. The dancers’ walking becomes stylized—skipping and rocking steps. Moore stops in a single spot and rotates, jostling her hips in tiny thrusts with her arm lifted straight and rigid in the air, while Bendernagel lurches in a heavy skip, as if tossing his ribcage forward after which his body follows. Moore provides an anchor to the space, a fixed point with a strong, direct gaze; Bendernagel is more difficult to pin down. The precise articulation of his feet, his torso tipped forward at the waist, his eyes turned downward, his path wavering: I think that the quality is like a tipsy doe, something elegant and potentially excessive, something not-quite-sober and not-quite-tame, timid and not-quite-threatening. The two eventually meet and walk facing each other, each looking into the others’ eyes as they make their way around the room. They partner with each other briefly, then a line of other dancers enter and move us into the next room. In the third space, the only lights are tucked between the dancers’ hands. The effect is something like fireflies swarming in loose patterns or constellations pulling back and forth into each star’s gravity, with hints of surfaces following in their wake: the soft glow of fleshy arms and legs and the swish of black chiffon skirts trailing behind the tiny lights. One by one, the starlight-fireflies process down a long hallway, and the audience condenses and follows after them. The next room is lined on one side with rows and rows of metal scaffolding. The dancers are lined up beneath it, their backs against the wall. One begins to move, and the others follow in turn. Eventually they are all moving as a pack from one end of the scaffolding to the other, swinging and pushing against the metal structure like an industrial jungle-gym for serious play. Their movements are sudden and layered, twisting and leaning through the gaps between the beams, and where their hands strike the metal, it gives off the sound of a heavy clang, an irregular gong. They do not dance in unison, but once they are all moving, they are held more or less together by an elastic proximity to each other. The fluctuating give of the relations between their bodies stretches in contrast to the heavy rigidity of the scaffolding around and through which they move. However, while they stay near to each other, I never see them touch; for as much as this sections presents a group of people and their flexible relations to others within a fixed structure, it also presents them maintaining some distance. In the next space, three dancers—House, Nedd, and Sauma—begin in one corner, bouncing lightly on two feet, the left foot flat on the ground and the right heel pushed up off of the floor. The room is a dim blue, and the audience forms a loose, irregular semi-circle around the corner that the trio occupies. Their bouncing is interrupted by a sudden jerk in one direction, a twist and reach in another. Their arms fling up and wide open, and somehow the trio splits, becoming a pair and a solo. Sauma, a few feet behind the others, performs similar choreography, but her version is heavier, smoother, and more sustained. She is set back from them, a bit of an outsider now, but performing similar gestures; her movement quality knits her dancing to theirs, carrying across and filling in the gaps of their staccato execution. All three eventually move through the audience, and just as I think we are moving on to the final space, they swerve back into the crowd, dancing again now in the middle of the audience. I can’t see them from where I am, but I can see a crowd turned in on itself, watching something at its center that not everyone can see. To the degree that we as viewers are made into a community by the commonality of our experiences—we’re all watching this dance together and we’ve all been led through this building together—here our community takes on a kind of mystery at its core. Suddenly we’ve become members of a secret society with different levels of initiation, and those of us at the outer edges look inward, trusting that those closer to the center are seeing what we do not. 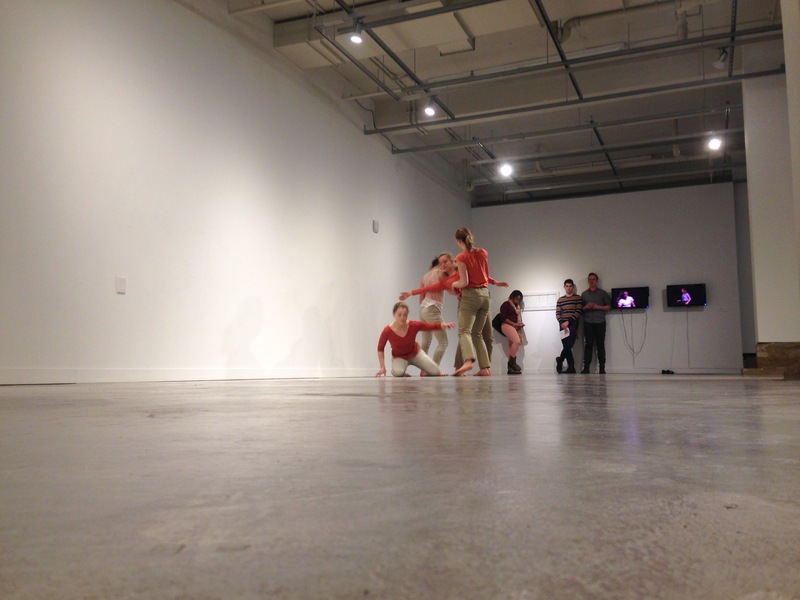 In the final room, back where we began, all six dancers occupy the long space of the MINT gallery. Although the space is still dimly lit, something about the use of the wide open depth and white walls make it feel bright. Tommy Batchelor stands at the center of the space, and when he begins to dance, it is acrobatic, leaping and spinning through the air, a dazzling spectacle here at the denouement. 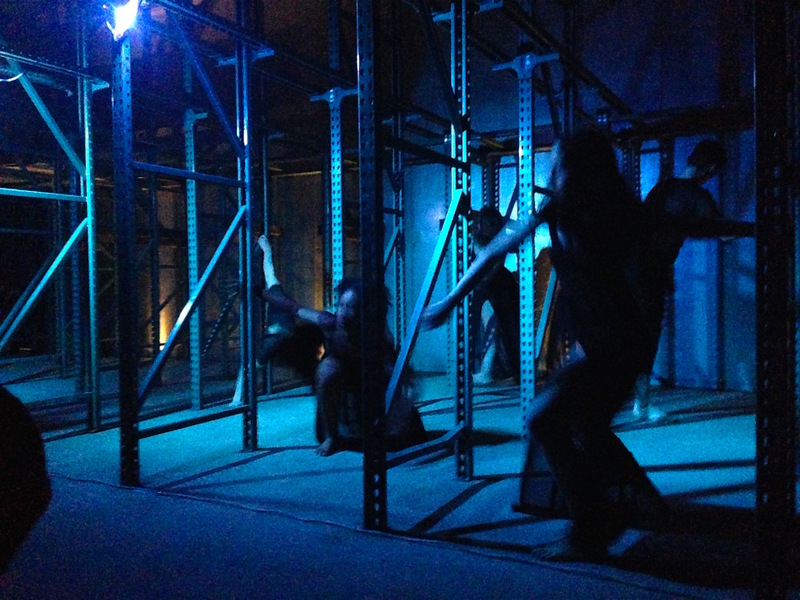 The dancers move through different groupings—Batchlor’s strong solo set against the gradual sweeping gestures of a trio, Sauma roaming at the edges of the space. There’s a moment with Bendernagel and Batchelor face each other and arch their hearts forward, then all of the dancers find their ways back to their partners from their previous vignettes—House and Nedd, Bendernagel and Moore. Sauma continues to stroke her hand along the outer wall, and House and Need come to Batchelor in the center of the room as the dance finishes. As the lights come up, I am left thinking about two elements that pervade the materials of this work: throughout the dancing bodies and different rooms and innovative lights, what carried me forward was a sense of anticipation. I knew that we would move on into another space, and while there were sometimes clues as to the timing of these developments, each moment of each vignette persisted with the question: when? Partially Nothing + Wholly Something will be performed once more, Saturday, March 7 at 8pm at MINT, 42 West Jenkins Ave, Columbus, OH.